Guy cooked up a chorizo and polenta lasagna with a cranberry citrus side salad on Guy's Big Bite. I took some of the same ingredients and ideas and took it for a spin. 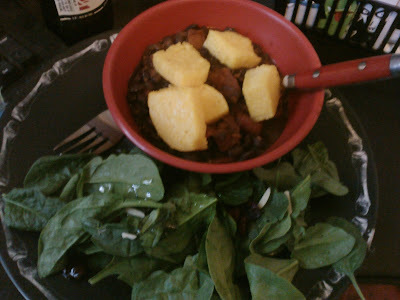 I made a soyrizo chili topped with polenta croutons and a cranberry, almond with spinach side salad. I added extra heat to the chili using up my farmer's market pepper stash and hot sauce. I kept the polenta croutons plain - so they could be mushjed up and absorb some of the heat and act like corn bread. The salad is simple: dried cranberries, slivered almonds, spinach with a balsamic vinaigrette I whipped up super fast. The sweetness and tang go well to balance the fire of the chili. 1 block of polenta cubed, drizzled with a touch of olive oil and baked at 350 for 20 minutes. Heat oil in a soup pot, add peppers chopped up (remove seeds if you are afraid of heat), cook for a few minutes, add soyrizo, cook for 3 minutes add the rest of the ingredients, stir and cook covered over medium low heat for 30 minutes. Place a big scoop of chili in a bowl. Top with a few polenta croutons and eat! All these flavors compliment each other so great. Great idea on the polenta croutons. I'll have to try this...I love the little polenta cubes!